My daughter is here once again to talk about her tips on organizing your clothes. This is one topic I need to work on myself! Clothes: If you find yourself with more clothes than you wear, consider donating the clothes you don’t wear regularly to Goodwill. Additionally, if you are like me and tend to be a hopeful clothes shopper (“This is too cute to throw out; I’ll have a good party to wear this to one day…”), there is a simple method for determining which clothes to keep and which to toss. At the start of the year, hang all of your clothes with the hangers facing outward so that you have to hang it on the back of the pole. As you wear an item and have to re-hang clothes throughout the year, hang them with the hanger facing inward so that you just drop the hanger right on the pole. At the end of the year, look to see which hangers are still facing outward; those are the ones you haven’t worn all year and the ones you probably won’t miss if you box them up and ship them out. To simplify your morning routine as well, consider putting similar types of clothing together in your closet. For example, I have sections for different types of clothing—professional dress for work, t-shirts and casual tops, and workout tops. I used my dresser for pants and items I don’t mind being wrinkled, like old sweatshirts and t-shirts for lounging around the house. My roommate, on the other hand, works outdoors, so her closet is almost entirely t-shirts and long-sleeve shirts. To better organize those and find the shirts she wants quickly, she organizes them by color. That system allows her to find the shirts she wants to wear quickly if she works at an event or needs a thicker one for colder days. For nicer clothes that pull at the shoulder if you hang them, consider a cubby system that sits on the floor and is designed to hold baskets for items. My roommate uses her cubbies with baskets for quick items, like socks, but I use mine without baskets to house my nice sweaters and shirts that I cannot hang up. I can also organize them in the cubbies so that sweaters and cardigans are separated and easy for me to see when I am in a hurry in the mornings. Because it’s an open-front system, it is much easier for me to see all of my sweaters and cardigans to compare instead of rummaging through them and messing them up if they are all stuck in a dresser drawer together (similarly to how my roommates DVD cases make finding a movie much easier). One bit of warning—if you have pets that like to snuggle in your sweaters, though, keep the closet door closed or be prepared for snagged sweaters! Yeah, I don’t think I could wear the same shirt everyday. Could you? I have to admit, I sometimes get tired of wearing the same shirt every couple of weeks! So, I’m off to turn the hangers around in my closet! If you’ve missed my daughter’s past posts on organizing, check them out here and here. Seems like everyone is cleaning-up and reorganizing this time of year, so I thought I would do just that on my blog. Thus, the new cleaner and neater look. And speaking of organizing, my daughter is back with tips on organizing their rather large collection of multimedia and books. Read her first organizing post HERE. Multimedia: Remember the cluttered old days when music came as CDs and movies came as clunky VHS tapes? Yeah, me, too—and I still have a stack of CDs in the spare room and VHS tapes as well as DVDs in our apartment. We have a good system, though, and it seems to be working rather well. 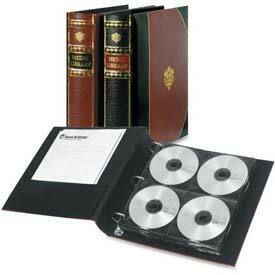 Several years ago my mom found a set of DVD binders that look like books but are designed to hold DVDs (or CDs if you are so inclined) without the cases, just the actual media discs. Each one holds around 128 discs, so they drastically minimize the storage space required for DVDs compared with keeping them in their cases—one shelf for four binders versus seven shelves for 60 DVD movies, 20 television shows on DVD, and roughly 20 old VHS taps that I’ve yet to replace. My roommate has kept her DVDs in their cases, though, and that actually works out better for us. I know that sounds counter-intuitive, but hear me out. I’ve never been one to buy popular movies, only ones that I happen to see on tv and love. My roommate, on the other hand, has a much vaster knowledge of movies because she sees them much more often and, therefore, has a better collection than I do. Together we probably have over 200 DVDs. 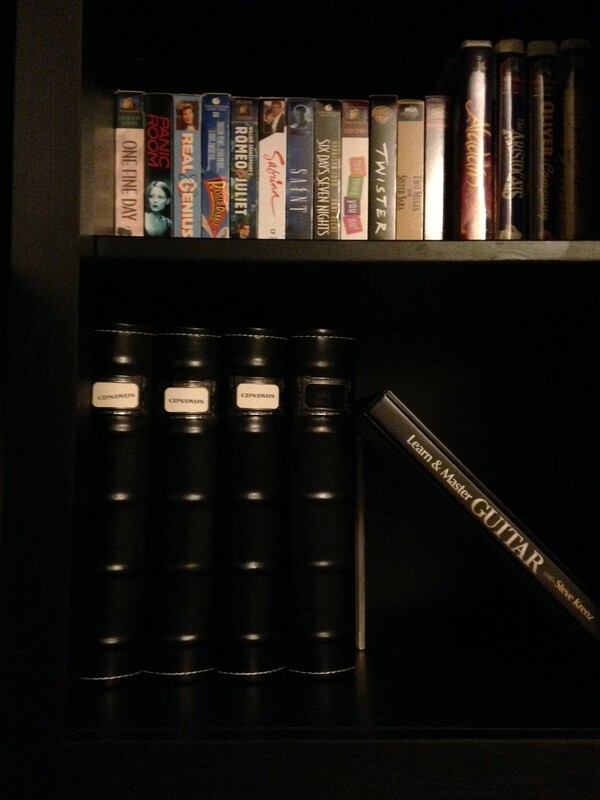 This is problematic because the binders I use make it difficult to compare all of our movie options at once when we don’t know exactly what we are in the mood to watch—you can only see four DVDs at a time before flipping to the next page, whereas seeing all of her DVD cases makes it much easier to figure out which ones we want to consider. Additionally, because we are limited on space with DVD cases, we have to consider whether or not a new DVD is worth the purchase—will we watch it enough to warrant spending the money and donating a designated spot of our limited shelf space for the case? If not, is it a classic I really want to own? If it’s going to end up in my binder after a few watches, then it’s probably not worth buying. And just go ahead and alphabetize your DVDs. Yes, it will take a while at first, but it saves so much time when you are home alone sick and looking for that one movie that will make it better. Trust me. Books: This is a separate category for us; it is not the same as multimedia. If you are a book lover, you too, will understand what I mean. If you are not a book lover, my solution is easy for you: buy audio books on iTunes or on Amazon to put on your iPod, and the only storage problem you will have will depend on how much storage is available on your device. You need not read the rest of this section (so donate your books to your local office bibliophile and make her day). 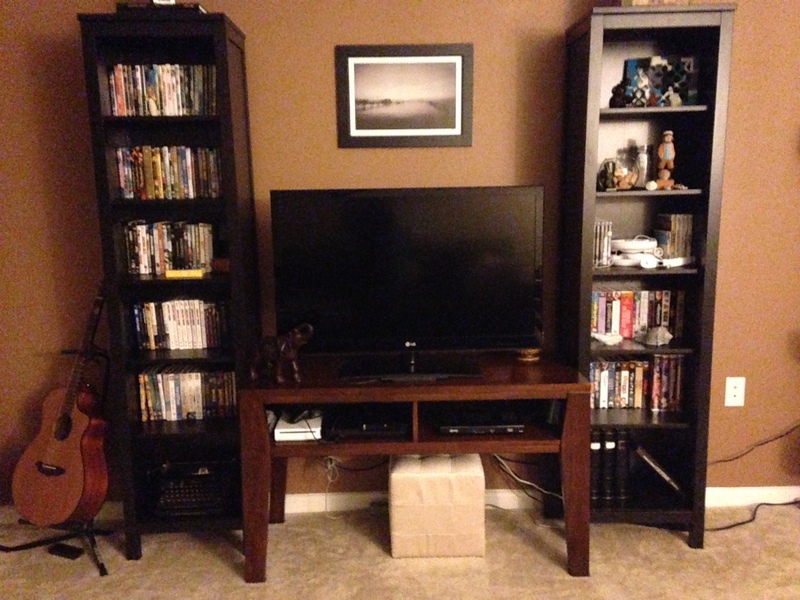 For the rest of us, however, we often run out of bookshelf space and are faced with the frustrating question of if or when it is appropriate to purchase a new bookshelf. If you are on a budget, a new bookshelf might not even be an option; if this is the case and you are a true bibliophile, you will eventually hit a wall…literally. Your apartment will hold no more bookshelves. Our answer solves two problems—space and budget. When we begin to run out of book space, we evaluate the books that we have kept, whether or not we will ever re-read them, or if there is a different reason we want to keep them, such as keeping our favorites to lend out to friends or books we might need to reference in the future. I’ll admit that I make some exceptions—I know I’ll never re-read some of the books, but I simply can’t part with them. Our emotional bond is just too great. Once we decide who makes the cut, we box up the ones we are letting go and take them to Half Price Books, which will pay you a (low) price for used books as credit in their store to purchase (new to you) used books to read. This helps us keep our book collection smaller so we don’t outgrow our shelf space and gives us credits for free books to keep our reading habits going. It’s a small thing, but it goes a long way for us and our biblio-addiction. Some areas have the same system available for CDs and DVDs. In Oklahoma, we had Hastings to trade in DVDs, and most areas have Game Stop for video games, which are much cheaper used and often come with a no-scratch guarantee. If you find yourself with a large collection of items, such as CDs, that you want to get rid of but can’t get yourself to donate them, check out eBay. Sometimes you can auction off items as a bulk to get rid of them quickly and make a little cash on the side as well. I hope her tips are helping you get a little more organized in your life! The “Closet Under the Staircase” is coming along wonderfully! We spent the weekend ripping out the carpet and the old shelves, painting three walls & the ceiling white and the fourth wall a vibrant color, and laying wood floors. (you really didn’t think I could paint a room and not put at least one different wall color in it, did you?) We still need to install some quarter round around the base of the trim and choose & install new shelving. Then I get to pick out what kind of organization/storage items I want to use. Baskets, metal bins, etc.? Decisions, decisions! My daughter is in the process of organizing her apartment and is sharing some of her and her roommate’s tips on living in and organizing small spaces. Today she is talking about organizing yourself. Starting on January 1st of this year, Netflix began streaming Friends—all ten seasons. Why is this a big deal? As a college student, my Saturday evening cleaning routine revolved around listening to the show in the background and reciting quotes out loud with each episode. (With over 240 episodes, they never get old!) Once television became too advanced, however, our non-HD, non-wide screen copies fell to the wayside and were replaced with DVDs of The Office and New Girl. As I’m sure you can imagine, my New Year’s Day experienced back-to-back episodes of the show’s first season and my cleaning routine fell into good, old habits with the renaissance of my favorite show—which got me in the mood for a little organizing. With the new year moving in, a lot of people make resolutions to clear out their junky rooms and reorganize for a more productive year, and that is a great resolution to make! Organization can make all aspects of daily living easier, faster, and less stressful, but many times it can be overwhelming to open the closet door, see how many clothes you have to go through or how much stuff has managed to pile itself on the shelves, and think you have to go through all of it to make any progress. If you are living in a smaller space with limited storage, however, making room and being innovative in your organizational methods is an absolute must! We live in a two-bedroom, two-bathroom apartment, which sounds like it would have a lot of storage—until you see how much stuff we have together. Because we’ve had to learn some organizational strategies to make the most of our space, we’ve become innovative in our storage and in our living. Here are a few tips to help others living in smaller spaces like us. Organize Yourself: A lot of the time, especially in apartments, there is a designated space for storing items, such as a bathroom linen closet, but no built-in organization. All of our closets have great shelves and space, but there are no drawers or separators to help us keep things in their place. If you try to make simple, flat shelves work, you are likely to run into the problem of things overlapping or losing their space as your collection grows. 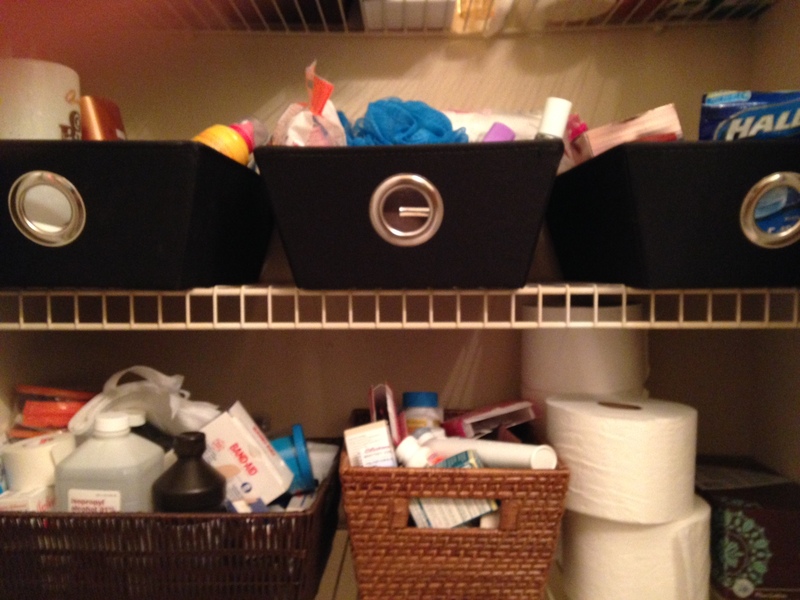 Lotions move into medications as the bulk of toilet paper you bought on sale takes over the bottom shelf and moves your Kleenex into the front closet. Suddenly, you can’t find anything you need and your well-intentioned work was all for naught. The best way to avoid this is to organize yourself before you organize your items. Baskets are a fantastic way to separate items by their purpose, which is very helpful for bathrooms. For our bathroom linen closet, we use the top two shelves for towels and wash cloths; for the bottom two shelves, we use baskets for everything else: we have baskets for emergency aid supplies (because you usually need to find those in a hurry), non-emergency medications that we do not take regularly (such as Tums or Advil), hygiene products (spare razors or toothbrushes), feminine products, and even beautification products, such as facial masks and nail polish. The baskets occasionally get a little messy and require us to clean them out again, but they make finding the Excedrin Migraine much easier when I need it quickly. Baskets are great for small spaces when the items do not easily lend themselves to simply sitting on a shelf. Other smaller items similar to baskets will work for various spaces as well. 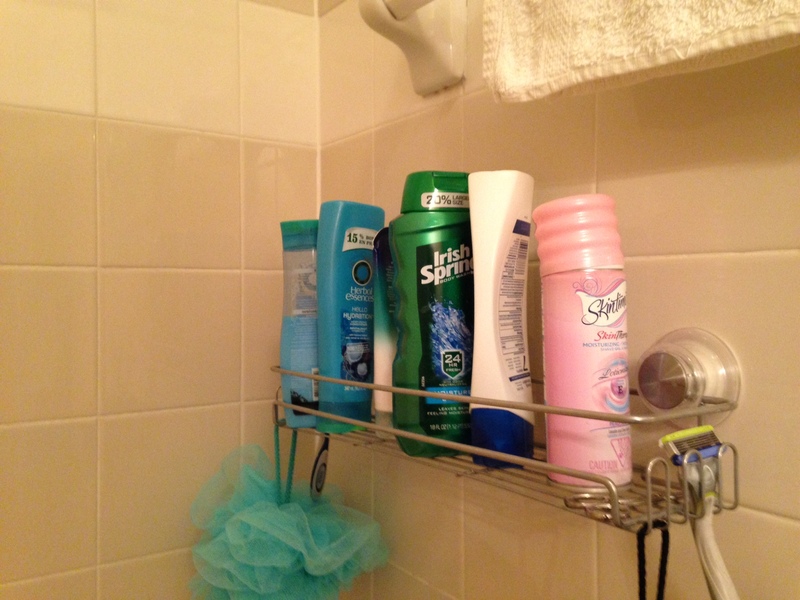 Take for example our shower shelf organizer. I was tired of having rings in the corner of the bath tub where shampoo and bath wash sat every day, letting towel strings collect and keeping the water from washing everything off. I found a great shower shelf that suctioned to the tile and holds everything at arm’s reach. It is easier to use and keeps the tub cleaner! For larger spaces, such as closets or bedrooms, larger tubs work in the same way—they even make long, flat tubs to store seasonal clothing under the bed. Don’t forget to label the tubs, though. Digging through seven tubs to find that your sports equipment is in the last one defeats the purpose of organizing it all in the first place. Lastly, keep in mind that, even though it might sound extreme, sometimes it does well to give everything its place and keep it there. My mom and I are the type that likes to assign a place to items and keep them there; that way we always know where things are and keep it all in order. This occasionally drives our other halves crazy, but it works. We have a small built-in desk at the end of our hallway. We never really use it as a desk, mostly just to keep our mail and important papers in order, so beneath it I keep our cats’ toys in a small cat bed so they are not all over the floor. For a few weeks, every time I would pick up the apartment, I would collect all the toys and drop them in the bed. After a few weeks, we noticed that our cats would go under the desk when they were wanting to play and come back with a toy. Even cats can learn that everything has a place for organization! Yep, that apple didn’t fall far from the tree when it comes to wanting everything in its place! I hope she has given you a few ideas to help you begin your new year organization!